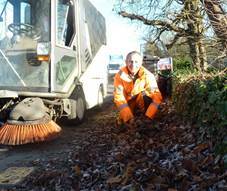 West Oxfordshire District Council collects hundreds of tonnes of fallen leaves from footpaths and streets each autumn helping to prevent flooding during heavy downpours and maintaining a clean and safe environment during the winter months. This work is completed on behalf of the Council by its environmental services provider Ubico Ltd. The company uses mechanical sweepers and concentrates on the worst affected areas in the District and those with the highest footfall. Crews work over the weekend during the busy periods to keep on top of the high leaf fall. Cllr Carol Reynolds, Cabinet Member for Environment said, “The scale of the task is huge as we have many so trees along our roadsides and pavements in leafy West Oxfordshire, but it is crucial that we do all we can to reduce the risk of flooding. Leaves on footpaths soon become soggy and slippery so sweeping them up is important for safety too. To report significant accumulations of fallen leaves on footpaths or other public areas, residents should contact the Council on 01993 861000 or online at www.westoxon.gov.uk.